Blooming Bellossom! Pokemon One a Day, Series 2! Many creatures from gen 1 expanded their evolutionary line in the Johto expansion. Bellossom blooms as part of fork in the road from Gloom, taking a turn towards something more bright and sunny. This helped me define a cheery concept for today's One a Day illustration! Bellossom be twerkin' and getting down with her bad self as part of her gimmick as the flower Pokemon. The obvious inspiration is that of a particpant of Hula, and general shout out to Polynesian culture. I decided to push forward with that concept all the way by creating art to have Bellossom be a hula dancer figurine as seen on car dashboards and such! The piece was very straight forward and took little time to complete. I got my base down very quickly, and looked at references of such figurines to settle on a pose. It was also helpful in getting down the straw skirt and base, which I tried to look like sculpted clay and painted. Not sure how I did on that part but I think it does the job. There's not much to say really, as the piece speaks for itself and not much thought was needed to complete the work. I set out to create an image in my workstation as I saw it in my head and I think the end result matches quite well. 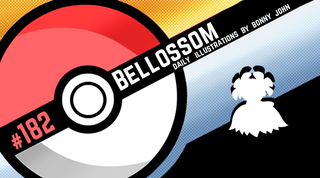 Bellossom can dance and participate in human activities for performance art. What Pokemon would you partner with for a performing art of your choice and why? Be creative and detail a routine if any!